White summer eyelet still intact, I'm willing to dip a toe into the autumn waters with these supple brown leather booties from Vionic. 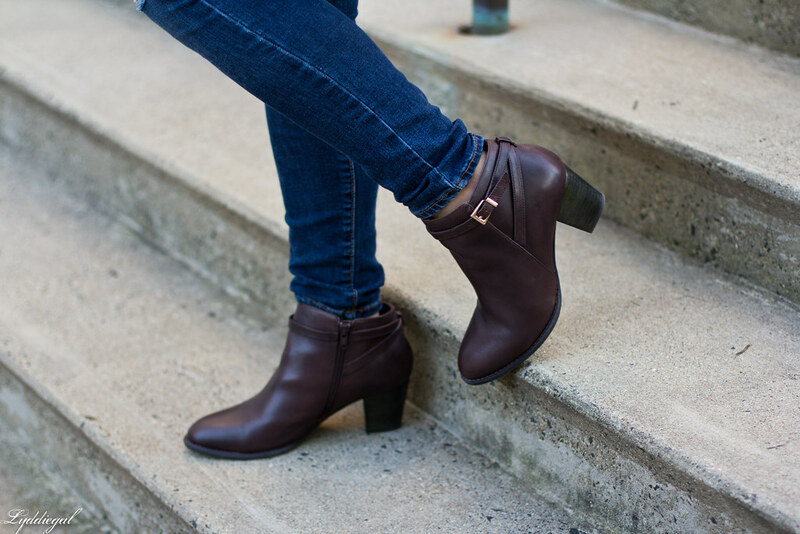 There is much to love about the 'Upton' ankle boot; available in three colors of genuine leather, I chose the java which has more of a mahogany look in person than the chestnut it's depicted in on the site. The heel height is very walkable at just over two inches, and most importantly, they feature an Orthaheel removable orthotic insert, providing arch support that is lacking from most shoes. They aren't unreasonably priced at $160, and cater to sizes from 5 to 11, including wide with options. Last year my search for the perfect black bootie started in September and ended in January, with countless tried and failed boots in-between. This year my search for the perfect brown bootie has started and ended with this option from Vionic. Vionic provided me with these boots for the purpose of this post. All views and opinions are my own. 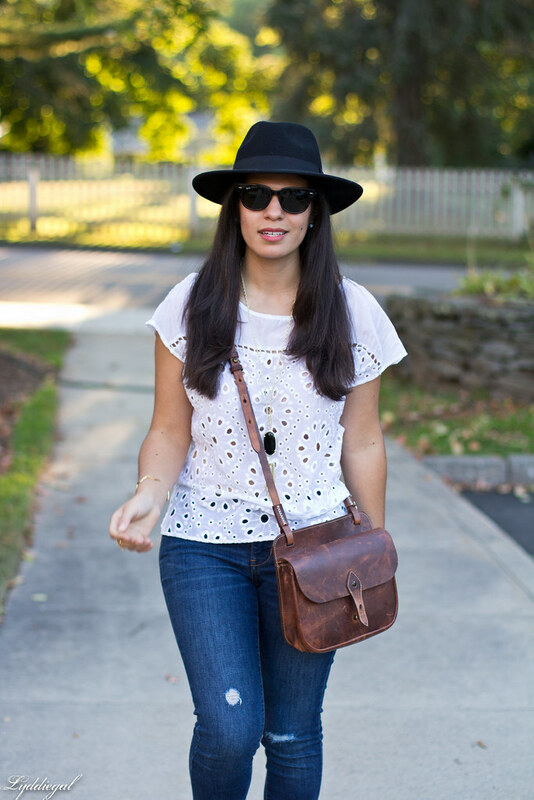 I love how you styled your eyelet for fall - it's so cute! And I have high arches, so I love shoes with arch support! Booties are my favorite way to transition into fall! Your new booties are so gorgeous! I won't lie... it's mainly the orthotic heel insert that makes these boots sound appealing to me. And I know exactly how old that makes me sound, but it's true! I walk a lot and anything that gives added comfort is huge. (I only wish I could find flats with an orthotic insert, I'd be so much more likely to actually wear them, ha ha.) Seriously, though, I remember your black bootie search and I have to say, I'm glad you brown bootie search was smoother! 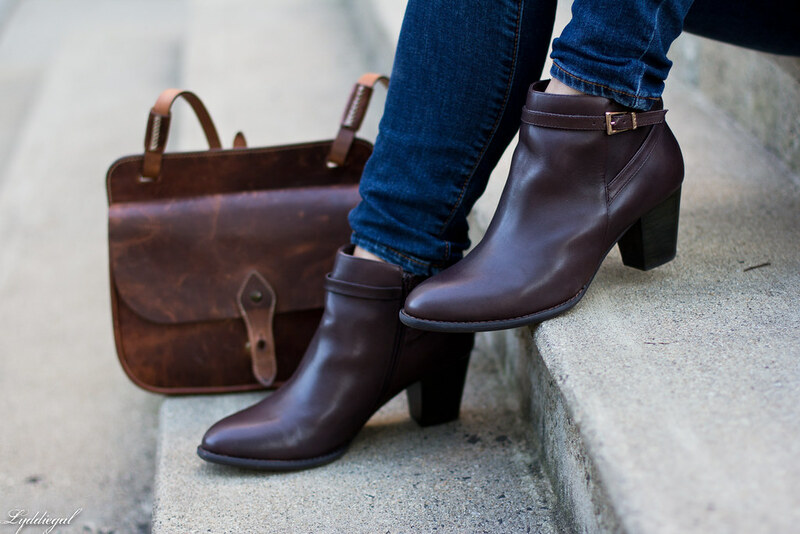 I'm on the hunt for a pair of brown booties this season myself but I suspect that, like so many of my shoes, mine will come from Sezane (and because I am apparently old, I will put in my own orthotic.) I will probably wear them with an outfit very similar to this one, because to me it is the perfect combination of casual comfort and put together style. I love jeans + a bootie can make summer staples more fall-ready. You look great here, doll! 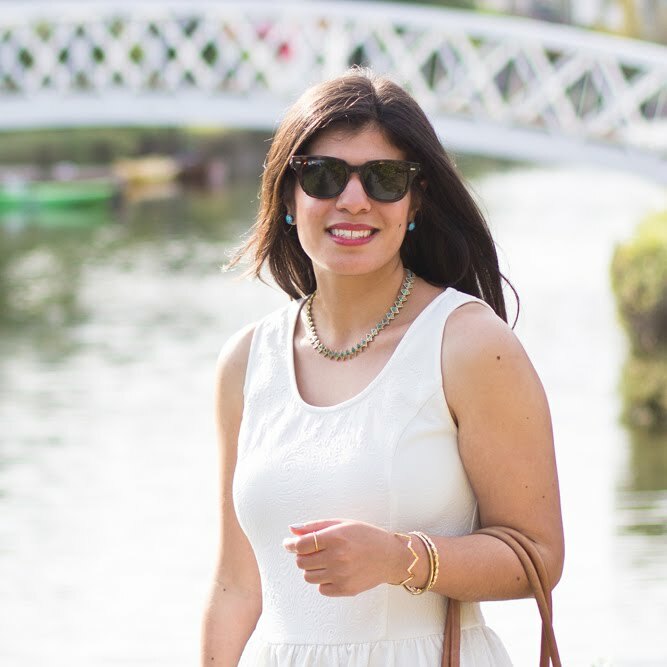 You have been the eyelet queen this summer and I am glad to see it continue. 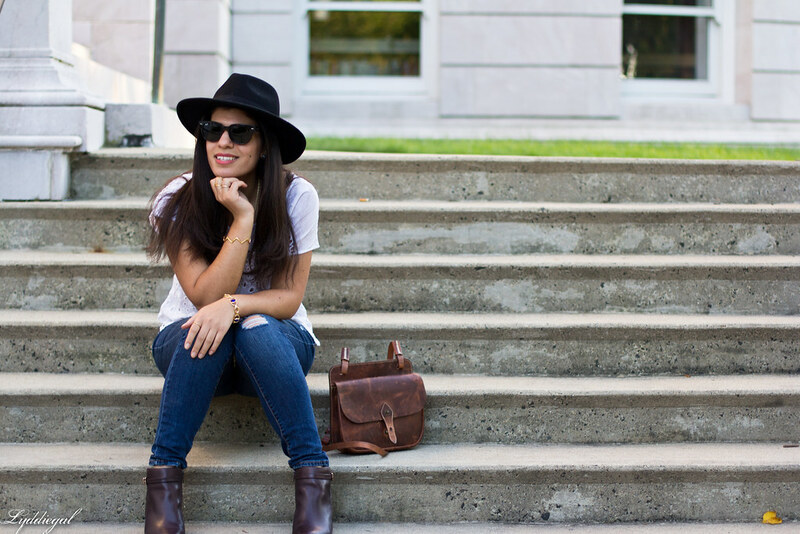 I love the bits of neutral colors in your look too with the brown booties and black hat! 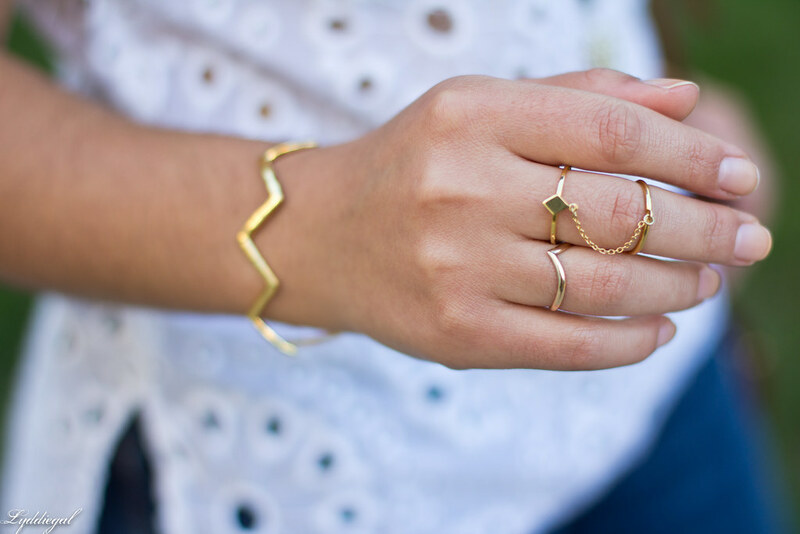 Loving all your gold jewelry! Especially those rings! And that bag! Basically I love all the accessories. I love those booties. Such a classic look. I cannot wait to pull mine out. They look so cool with the eyelet and jeans. There will be probably be an inspired look coming soon from me. STUNNING as always! Always happy to see your smile! I so understand your story. I find when ever I'm on a hunt for something it's harder to get and the minute when I let it go, it finds way to me. Just at the end of the winter I had a crazy idea to find for next Fall/Winter season brown boots, yet I wasn't sure what kind of style I want them. Now in a middle of summer I found on sales gorgeous boots, yet I didn't purchase them and now they out of stock. Of course now I'm regretting it. I'm not sure what's the reason behind it, because I haven't been for shopping all summer. Just not in the mood. Or too busy working on my jewelry collection. That's great that you found them and got them. There's no such a thing as too much shoes/boots and they already looks wonderful with your transitional look into Fall. Great outfit, in love with your ankle booties!!! This outfit is the bomb! 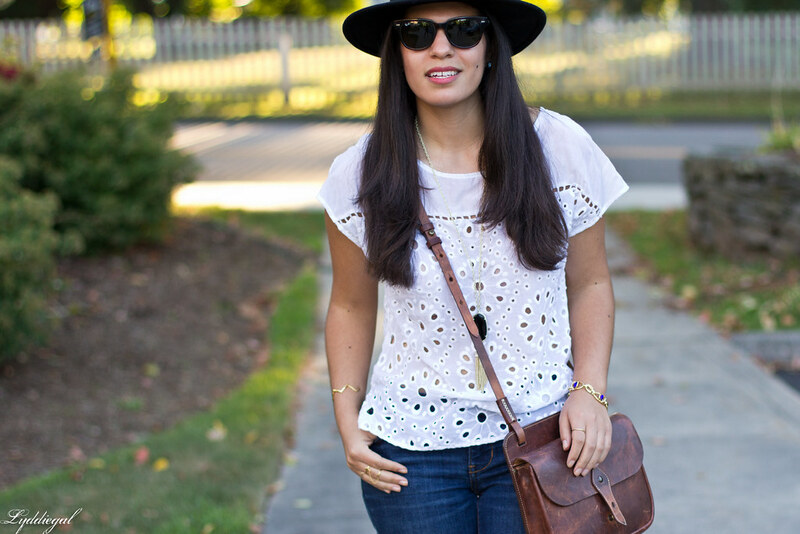 I love everything from the hat to the eyelet blouse down to your ankle boots! Gorgeous! Such cute booties!! I am so glad Fall is coming so the boots make an appearance!! You look amazing! These boots sound super great-- I almost always put inserts in my shoes. I love fall fashion but I can't believe how hot it is again this September! Those are gorgeous booties--I love the dark mahogany color! 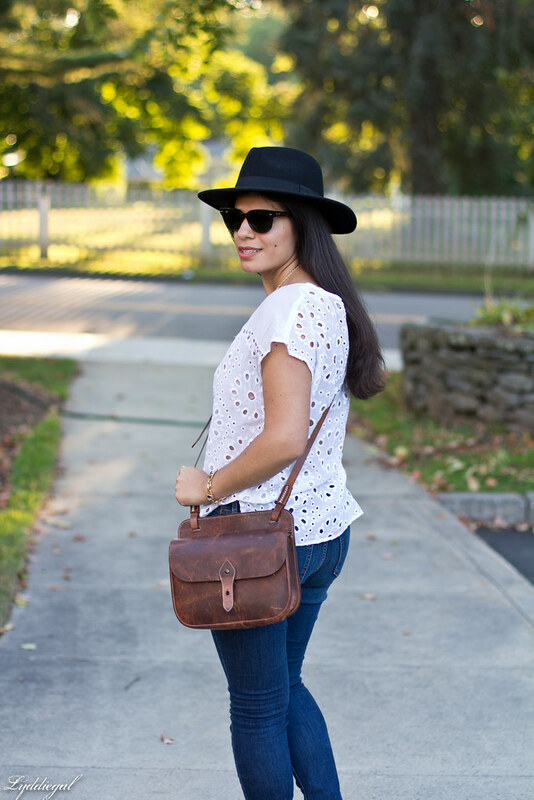 I love booties for dipping your toe (hehe) into fall without overheating--perfect to balance them with white eyelet! Love the vintage vibe of your purse. So nice to find your perfect booties already and now you get to enjoy them this fall. beautiful eyelet and i'm loving those boots on you! I love those booties, brown can be so underrated sometimes. Really love those booties! They are gorgeous and are a great color. Those boots are so sleek and stylish! Love how they look! That last pic is great and I think the boots are nice even though I am not a boot person. I guess its they I dont need them for where I live syndrome.